Last week we hosted a wonderful and energetic group from Brazil. Their itinerary was filled with unique experiances and indepth visit of Slovenia. One of the programs included also a team building activity that is suitable for different groups. We decided to offer an insight look into the Istrian heritage on the Slovenian Coast. After the visit of the winery and the first glass of ‘aperitivo’ the guests took part in the cooking class. This time the main dish were the grandma’s gnocchi. Peeling the potatoes mixing the ingredients and cutting the gnocchi became the ultimate fun. 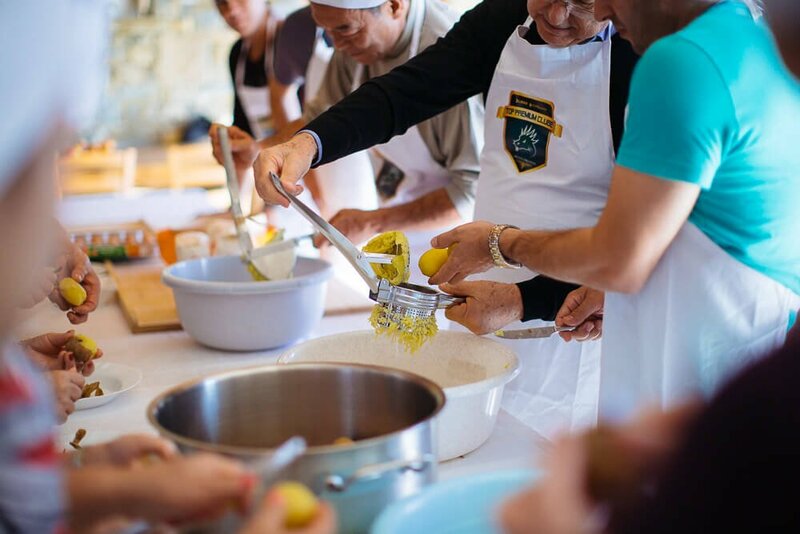 Guests spend a carefree afternoon learning a traditional recipe, that is also part of our everyday lifestyle. We all have a ‘nonna’ that makes the best potatoes gnocchi. Usually the main condiment for them is a homemade goulash or some truffles to be sprinkled on the top. The success of the recipe is guaranteed. The event is suitable for groups in Portoroz or Slovenian coast, that would like to get to know the local inhabitants and spend with them an afternoon in a fun and active way. Contact us and we can create an event, that is seasonal and vibrant, but most of all delicious.